Yet our team’s response to the challenges that came at us this year fills me with much more pride than any anniversary celebration ever could. If there’s one idea that sums up APQC’s 40-year legacy, our incredible team, and our future, it’s continuous RENEWAL. We were saddened to say our final goodbyes to APQC Founder Jack Grayson in May of this year, but RENEWAL was a big theme in Jack’s life. Back when he founded APQC in 1977, his hope was to create an organization that would RENEW the country’s focus on productivity and competitiveness. He was also a big believer in personal self-RENEWAL, reinventing his own life, time after time, while embracing every opportunity for fun along the way. At our first Founder’s Day celebration in 2015, we renamed our amphitheater Grayson Hall in his honor, because he inspired and challenged all of us to reinvent and redefine our own futures every day. Little did we know then that we would all get another valuable lesson in RENEWAL when Hurricane Harvey flooded not just Grayson Hall, but the entire first floor of APQC’s beloved Treehouse that Jack built. It was our can-do spirit of RENEWAL, resilience, and reinvention that pulled us through the flood and got us back quickly, and it’s that same spirit that has made APQC a beacon of light for thousands of people for four decades. 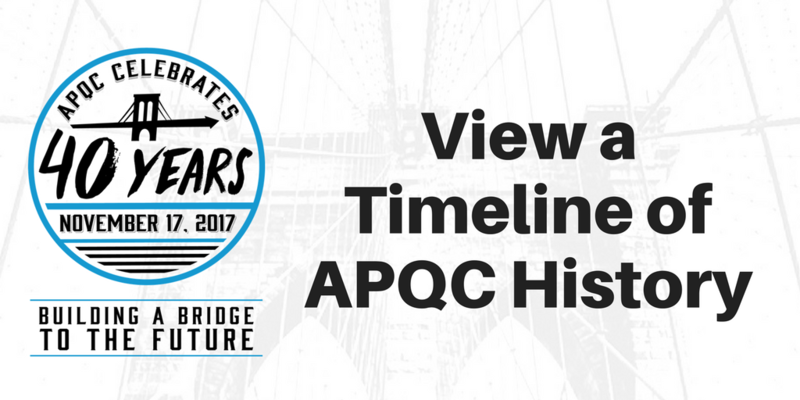 I can’t begin to quantify the entire impact that APQC has made in 40 years, but looking back, there are a few major accomplishments that make me especially proud. The White House Conference on Productivity was first organized by APQC in 1982 to address the nation’s challenge of greater productivity growth, which was and is of supreme importance to America's future. Malcolm Baldrige National Quality Award, established by Jack and APQC in 1987, remains the only formal recognition given by our nation’s president to honor U.S. organizations for performance excellence. The Process Classification Framework (PCF)®, developed in the early 1990s, has evolved into a broad taxonomy used by thousands of organizations. The PCF also provided a foundation for APQC’s Open Standards Benchmarking®, which enables benchmarking against more than 1,500 standardized measures spanning people, processes, and technology. Over 12,000 organizations have participated so far. America’s first Knowledge Management Conference, first hosted by APQC in 1995, is now an annual event that still brings together the best and brightest KM minds for learning and sharing. APQC continues to be the world’s leading resource for all things KM. The APQC education initiative, which began in 1997 and was one of Jack’s greatest passions, has saved more than $125 million and countless hours for schools and education entities across America, boosting student achievement. Even as we take a look back to celebrate our legacy, we’re continuously RENEWing our focus on delivering more value to our members. In our 41st year, expect to see a reinvented digital experience, with more enriching and relevant content to help members work smarter, faster, and with greater confidence. As always, we’ll stay on the leading edge of the issues that matter most, tackling practical, future-focused topics such as artificial intelligence in knowledge management, the digitization of the supply chain, and robotic manufacturing. If there’s one thing we’ve learned in our 40 years – and especially this year – it’s that with every crisis comes an opportunity. So as we RENEW our focus on our future plans, we encourage you to find ways to RENEW your own focus on positive change in your own life and community. If Jack were here, I’m sure he would jump in to point out one good way to do it: Reach out to your local school district and talk to them about how the APQC education initiative can help make today’s kids tomorrow’s leaders. And we want to say a big thank you to the innovators, disruptors, thought leaders, and professional service firms who push us to stay on the leading edge, and to every APQC member, we couldn’t do what we do without you. Here’s to another great year of RENEWAL, for us and for you.